7.5" Victorian Gaudy Welsh. The Jug is in fair condition no cracks crazing or restorations. Does have a chip to the rim of the jug. (As per pictures). Embossed Grapes. ALLERTON - Hand Painted Snake Jug Model No 30 circa 1912 Very Good. Charles Allerton & Sons were manufacturers of Earthen Ware and China at Longton, Stoke on Trent. Lustre decoration was a speciality and they traded from c1859 to 1942. Dated to around 1920. Storage # 501. Although the red line of the paint has chipped off in places.Overall very good. There is no manufacturers mark on the rear. ThisTea Pot is in good condition. TheTea Pot is 19 cm high. FABULOUS ANTIQUE GAUDY WELSH BLUE & COPPER LUSTRE LARGE FRUIT BOWL C1870. Seven 6ins Gaudy Welsh Style Side Plates. They are all in very good used condition with no chips, cracks or crazing. There is some wear to the golding which is to be expected. Nevertheless a lovely set of plates. Please note I also have listed a matching sugar bowl. ANTIQUE 19TH CENTURY, VICTORIAN WELSH ?. HAND PAINTED LUSTRE PLATE. THERE IS A HALF CIRCLE HAIRLINE CRACK IN THE CENTRE BUT PLATE IS STABLE. A Beautiful Extensive Gaudy Welsh/Dutch Tea Service. With a bit of help I have identified this as a variation of the Vine Pattern. To the base of each saucer in Purple lustre is the pattern number 601/109 which ever way you want to look at it. 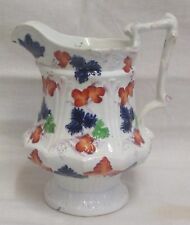 ANTIQUE SUDLOWS, BURSLEM GAUDY WELH IMARI COFFEE POT. LOVELY GOLD RED AND BLUE IMARI PATTERN GAUDY WELSH COFFEE POT. 19THC CHINA 23.4CM PETAL SHAPED PLATE WITH GAUDY WELSH FLOWER DESIGN DECORATION. TIS ITEM HAS SLIGHT CRACK ON BASE BACK-- HARD TO SEE FROM THE FRONT. Clear makers date lozenge to base on both. Pattern sharp and bright, have been cabinet collection pieces. Large Gaudy Welsh mug, comfortably holds 1 pint. I think it will date to early 20th century. Stained crazing and other marks. 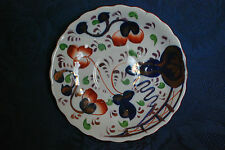 A Gaudy Welsh Imari handpainted plate, Victorian era, 8 ins across. Stunning Victorian Gaudy Welsh Imari pattern tea pot and stand. Remarkable condition with one small chip to underside of spout revealing it's brown pottery. The base of the tea pot has cracks to the glaze. This small Victorian antique child's mug is decorated in the Chinoiserie manor. The ground is cobalt blue with deep orange flash & gold decoration. The transfer pattern is hand painted. ANTIQUE VICTORIAN GAUDY WELSH. THIS ITEM HAS STAINING AND CRACKS IN THE BASE-- SEE PICTURES. ONE OF THE LESS COMMON PATTERNS TO BE FOUND IN GAUDY WELSH COLOURS AND WOULD SUIT COLLECTOR. Three Gaudy Welsh Saucers C1850. Dispatched with Royal Mail 2nd Class. Various patterns Good condition except one has a small star hairline crack, being the one on the 5th and 6th photos. 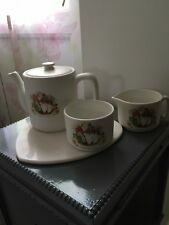 Circa 1900. gaudy welsh Blairs china. 3 cake plates and 3 saucers. great condition. Excellent examples. No chips. Some ‘normal’ glaze imperfections. Royal Mail 2nd Class. Made by Allertons. here we have a lovely "gaudy style" jug. 4.25" (11cm) high. VINTAGE GAUDY WELSH POTTERY PLATE 8"
Gaudy Welsh Jug 4” Tall. Dispatched with Royal Mail 1st Class. Lovely small Gaudy Welsh jug, pattern unknown. Height 10cm to lip. All colours bright, lustre excellent over the blue & green.